Home wwe facts wwe latest updates Low Blow in WWE are real or fake? - WWE amazing fact !! Low Blow in WWE are real or fake? - WWE amazing fact !! Is low blow a real move in WWE? As we had seen in year 2018 low blows are used much often by many wrestlers. 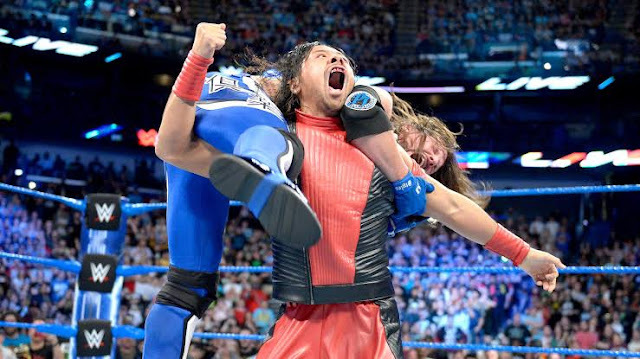 In the beginning we had seen Shinsuke Nakamura using this move a lot on AJ Styles and also after that when Dean Ambrose turned heel, he also used this move a lot on Seth Rollins. And by the end of this year Daniel Brayan also used this move very frequently on AJ Styles. So we can say that a low blow is a move of a heel superstar. But now the question is that Why Low Blows are used in WWE? So let us make you sure that WWE uses this move just to make a heel superstar more aggressive and danger and they wants from fans to spread more hate about the particular heel superstar. But now the biggest question is that are low blows real or fake? So now let us make you know that the intention of any WWE superstar is never to hurt his/her opponent. All WWE moves and promos are always scripted. But however sometimes wrestler is not able to perform it perfectly, which causes a serious injuries.
. 5 shocking returns to happen at Royal Rumble 2019 match !!
. WWE Royal Rumble 2019 winner revealed !!
. The Rock is finally returning for the Universal championship !! So if any superstar hits a low blow on other superstar, his intention is not to hurt the other one. All moves in WWE are scripted and performed by mind but not by their intentions. Their only intention is to make fans entertain. WWE superstars uses this move so perfectly that it always seems look likes a real move and entertain their fans. But sometimes it is performed wrongly which causes a serious injuries. Also during performing this move WWE superstars have to give their best face reaction so that it could look like a real move. But however low blow move is not real. Hence, it is totally scripted. So now we hope that your all questions regarding low blow is cleared. Still if you have any doubt then you can leave a comment in the comment box below. So readers.. Is their any question in your mind regarding low blow move?